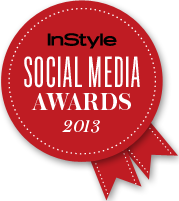 I'm nominated for InStyle's Social Media Awards!!! I have the privelege and honor of being chosen as one of five wonderfully talented nominees for InStyle's Social Media Awards in the "Most Inspiring Manicures" category! Click the button to vote! Seriously, the other girls have mad skills, and I'm thrilled to be included as part of that group! I was nominated for my tutorials Pinterest board so be sure to check that out if you haven't already! I would love your vote and support, and love it too if you spread the word about the good news to all your friends! You can vote as many times as you want here! Thank you InStyle for the nomination, Jenn for informing me about it, and congratulations to all of the nominees! You all deserve it! Well deserved, congratulations! I too have many pics of yours in the ol' inspiration folder :) I am heading over to vote now!